Racin’ Today » Flat Spot On: Need for Speed Satisfied at Talladega? Flat Spot On: Need for Speed Satisfied at Talladega? 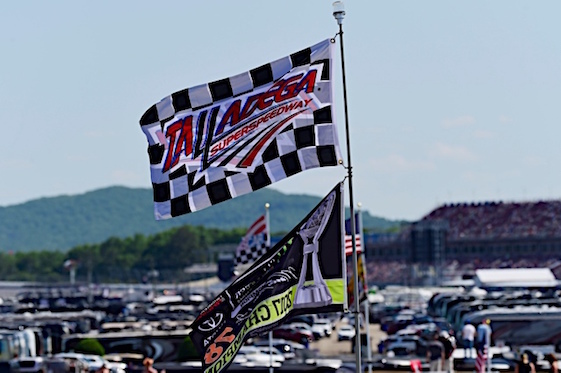 TALLADEGA, ALA. – When you arrive at Talladega, it’s like being in the belly of the beast. 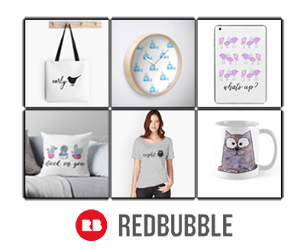 You sense that something could go bad wrong. Such as Jamie McMurray’s multiple flips Friday on the back stretch. Then you realize it’s those rather remarkable men in their flying machines (sometimes) who are running crazy speeds and the rest of us are watching them tackle the beast and occasionally miss the mark big time. Before his Friday meeting with the outside and inside wall – the latter came a little too close to being cleared – McMurray’s Chevy turned the fastest lap in the afternoon practice at a rate of 203.975 mph. That’s way fast and just an average. When a tire problem sent him catawampus, McMurray was certainly above 230 mph. I have no special knowledge or inside scoop on it, but I think NASCAR officials wanted to increase speeds, acceleration and passing on the restrictor plate tracks by eliminating any ride height rule. The low-to-the-deck cars also makes them difficult to drive. All of the above could be counted on to hype the spectacle and challenge the remarkable talent of the current crop of drivers. 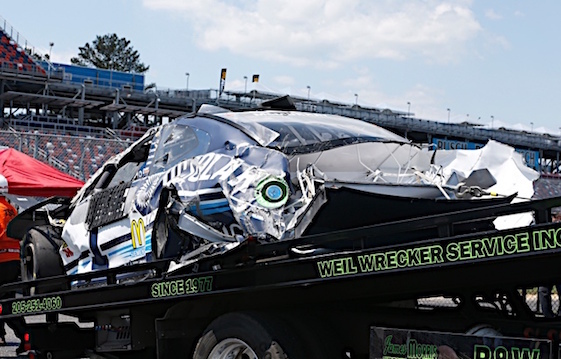 The plan went awry with a fence-climbing car, all too reminiscent of Bobby Allison’s near miss of the grandstands in 1987 that brought on the restrictor plates – which were tightened enough overnight to reduce Saturday’s pole-winning speed of Kevin Harvick to a 194 mph average. The speeds on Friday were still far below the 212 mph average of Bill Elliott’s pole record for stock cars from the same year as Allison’s crash. Just how much does speed at Talladega or the other restrictor plate track in Daytona Beach matter? aren’t buying a ticket to the hospital. The issue of fan safety didn’t work out this weekend in terms of a close call and perhaps the lower ride heights didn’t quite work out as expected when it came to keeping cars from getting near the top of the fence. Can we get back to average speeds above 200 mph? I would continue to pull for that and here’s my rather unoriginal suggestion. Put another round of higher fencing up at Talladega and Daytona, then turn ’em loose at higher speeds. In my humble opinion, there needs to be a renewed step in the direction of 250 mph down the back straight, at least, to emphasize the extraordinary capacity of the drivers and car builders. NASCAR, in other words, could use more swagger. Guys like Neil Bonnett from nearby Bessemer, Ala., who lost his life at Daytona, used to always say that when you turn off that Interstate to head for Talladega, you’d better be ready to run wide open. Well, the restrictor plates have put an end to that and more’s the pity. Give NASCAR credit for trying the higher speeds, but until the fences get taller it’s not going to get much faster than sub-200 mph qualifying averages. To get to Talladega from Atlanta, the Interstate runs between thick, mixed stands of pine, popular and oak. Driving through the walls of green is a little like traveling the back roads of the mind. Back in the days when rookie Ron Bouchard was the first of many surprise winners at Talladega, the number of fans was fewer than the gathering Sunday. It’s all relative, but recent turnouts like Sunday are not encouraging, because they are inevitably compared to the late 1990s and early oughts. Underlying the seemingly now eternal question about NASCAR’s no-longer-enormous crowds is the question of safety. Does the fact that drivers walk away like McMurray from the most extraordinary collisions, twirls, flights, flips and sudden stops take away some of racing’s swagger? Drivers may be in the belly, but is the beast missing? Those who would rather see their heroes risk life and limb have probably left the building, no doubt, and if that’s their rationale they won’t be coming back. On the race day that was the same day as Dale Earnhardt Sr.’s birthday, it continues to be a fact of life that motor racing cannot afford to lose its stars through fatal accidents. It’s bad enough when they retire in clusters – or drop out due to valid concerns about concussions. 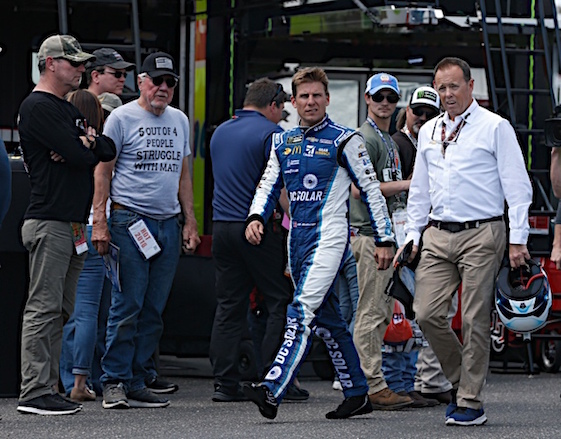 McMurray walking away on Friday confirmed that NASCAR has the safety right. or wrong. Well, now that the complaint department is open, I would suggest that the guy who runs the sport – the same one who sold the stock in NASCAR that he inherited from the two generations who built it before him – should show up at the track more often. (Like every race weekend.) And, all those marketing types that were hired to turn motor racing into a sports property? Find some replacements with a passion for racing. Alas, there’s the problem of young people not being as interested in cars, a change in viewing habits when it comes to all sports and just plain bad timing when it comes to major stars retiring – whether they show up later in the TV booth or not. But I would say the biggest generational problem is that motor racing may be like a locomotive these days – no longer a cultural icon of extraordinary. The drivers and mechanics in the NASCAR garage have long since proven themselves to be mega-extraordinary. And, they didn’t flinch when it came to going faster this spring at Talladega, although some predicted nothing but a crash fest. The participants are not the problem. It was nice to see Joey Logano get back on a winning track after a year off. But would a faster race have been more interesting or at least more lap-by-lap tense? Tough question. One hopes NASCAR keeps pondering it and finds a way to go faster without losing tires or cars over a fence.